This morning, I had some ingredients left over from my brownie and cupcake baking extravaganza so I decided to make some American pancakes. Additionally, I wanted to try the new apple and vanilla puree (£1.95, not available online) I bought from Daylesford Organic yesterday during our jaunt to Notting Hill with John's mum. While flipping a pancake, I remembered that England celebrates Pancake Day (or Shrove Tuesday), which falls on February 16th this year. One of the most fascinating differences between England and America, however, is how they define "pancake". The thick, fluffy ones I made above are what I would call a pancake (Brits would call them either American or Scotch pancakes). 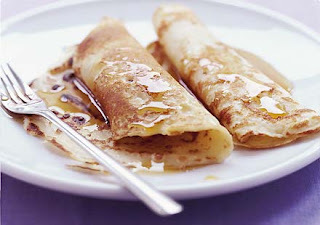 The papery-thin, light things that resemble French crepes (below) are what the English call "pancakes". Imagine my shock then, when presented with one of these and a spoonful of sugar and half a lemon at my first Pancake Day in Oxford, five years ago. "What's this?" I asked, confused. "A pancake, silly!" said my host at the time, brightly. "Um ... ok ... where's the syrup?" "Oh we don't use syrup, just a dash of lemon juice and sugar is traditional." Ok, I wouldn't knock it till I tried it, and it was pretty good. Different, but good. It definitely wasn't as satisfying as a stack of the thick and fluffy variety for breakfast, but it worked. So if you're around on Pancake Day, make sure you specify which kind of pancake you're after - otherwise you could be left pretty disappointed. Hehe I was going to ask for the recipe - thanks!